I’m totally elated right now. This is due entirely to the fact that I recently finished the most fun design project ever. If you follow Emily Henderson’s blog or Oh Joy!, then you know about Joy’s awesome new studio space. It was a collaboration between Emily and Joy and the end result is so gorgeous. The part I’m pinching myself over is the fact that I got to work on this amazing project! Let me back up momentarily. How, you might ask, did my involvement come to pass? 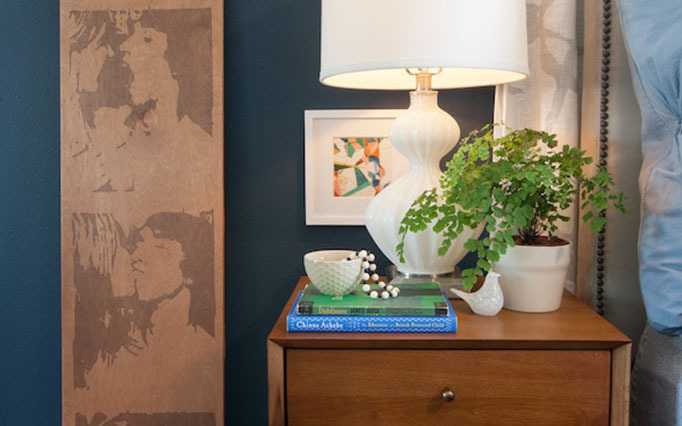 Well, it started a few months ago when Emily ran a nightstand styling contest on her blog. To my delight, Emily chose my nightstand as the winner of the contest! As busy as she is, she not only ran this contest, culled through the hundreds of entries and wrote a huge post about it, but she also contacted me herself to congratulate me on winning and thank me for entering. Much respect to her. Here’s what my “winning” nightstand looked like. Anyway, that was how we got to talking, I sent her my resume, interviewed and ultimately wound up helping with the design on Joy’s amazing studio space!! I’ll admit, when I drove up to LA to meet Emily and Joy for the first time to discuss the project, I was totally nervous. I just have so much respect for these creative ladies and did NOT want disappoint them! 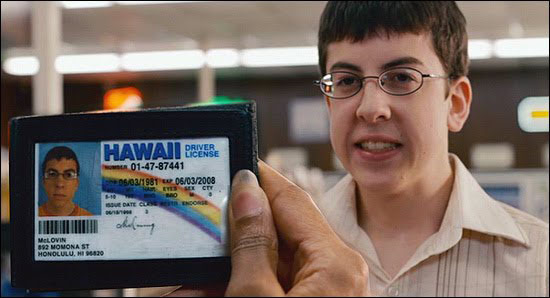 Plus, they’re both so cool and LA, whereas I feel like McLovin most of the time. That is to say, a huge dork hoping to pass for cool. I was relieved to find, however, that I had nothing to fear. 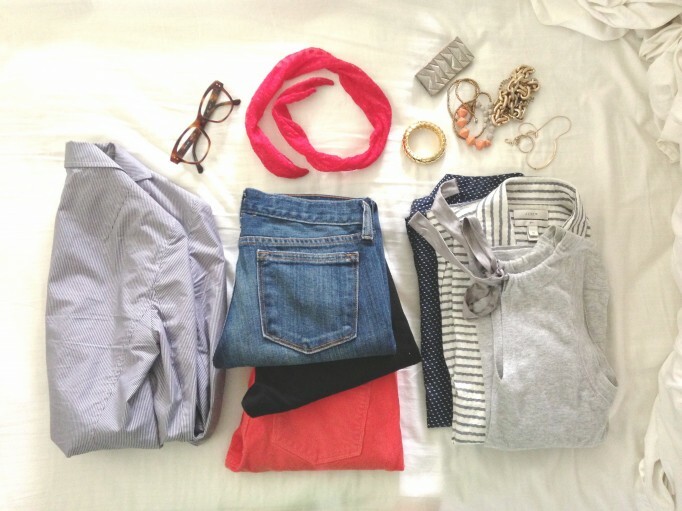 Emily is just as hilarious and friendly as you would expect from reading her blog and so crazy talented/creative. And Joy is totally friendly, warm and hardworking (she has EARNED this amazing studio space for her expanding business!). And Ruby, well, she dresses cooler than I do. There will be more posts coming up from Emily and Joy detailing the design process, sources, and how we DIY’d several areas of the space, so stay tuned for those. I’m so insanely jealous of this office space! Above photos of studio designed/styled and Emily Henderson and me. Photographed by Zeke Ruelas. I’ve never been a huge fan of personal photos scattered throughout the home. I think it’s because the tendency is to use photos that, even though they were taken on a special day, may not be the best photo compositionally. 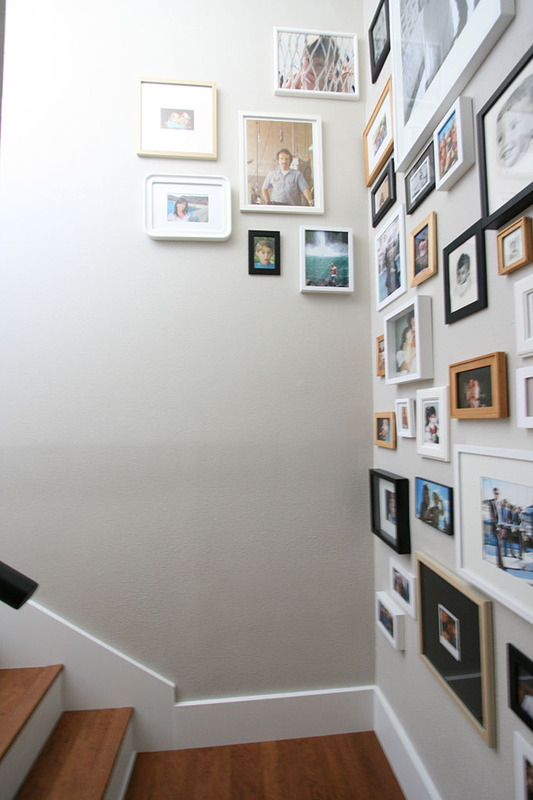 Add to that the fact that they’re usually framed haphazardly and propped all over the house, and the photos just read as clutter. It’s important for me to have family photos in my own home, but I like to approach it a little differently. In the case of our house now, I had a HUGE wall in our stairwell that needed something really dynamic. 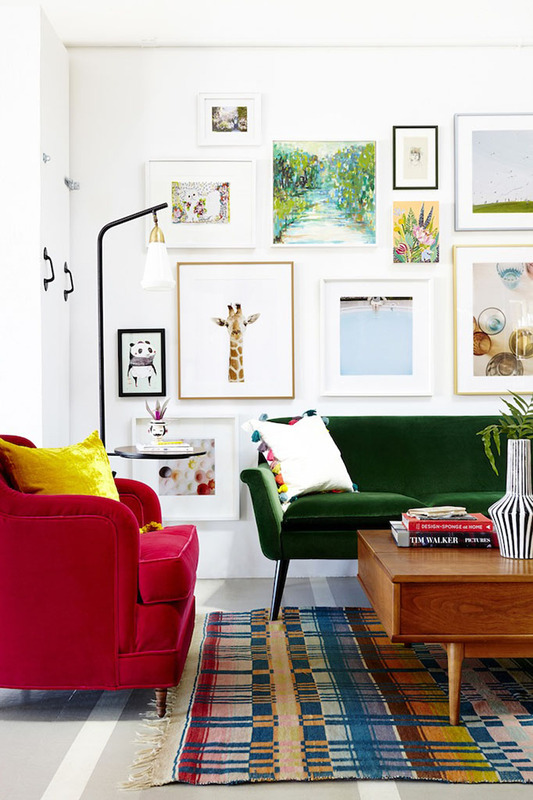 To fill this wall with art could have gotten expensive. 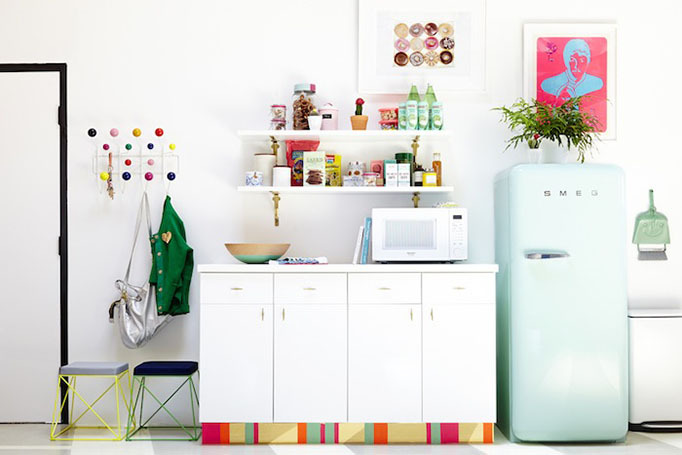 To hang only a couple pieces on it would look anemic. 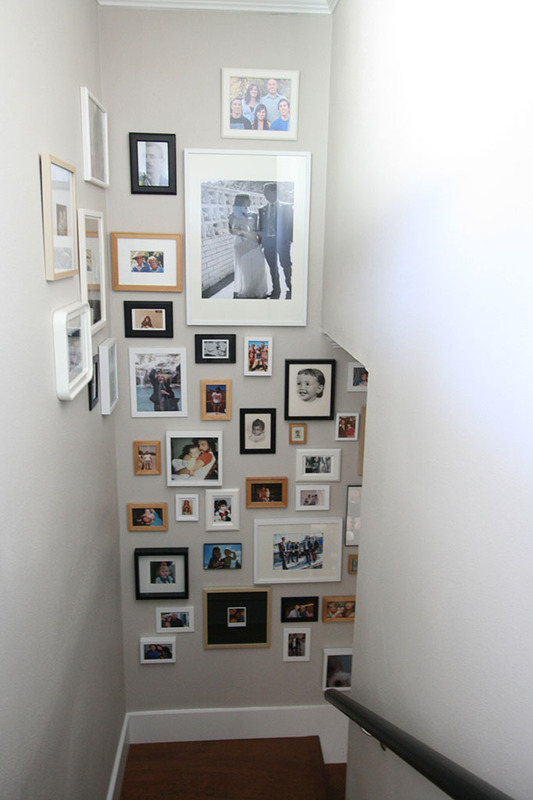 So I decided this was the perfect spot for a gallery wall of family photos. I started by gathering a ton of photos of my husband’s family that my mother-in-law had. Then I dug through all the photo albums my mom had so meticulously kept over the years. I was looking for photos from special occasions, sure, but more importantly I was looking for photos that were special in and of themselves. Here are a couple examples of what I mean. 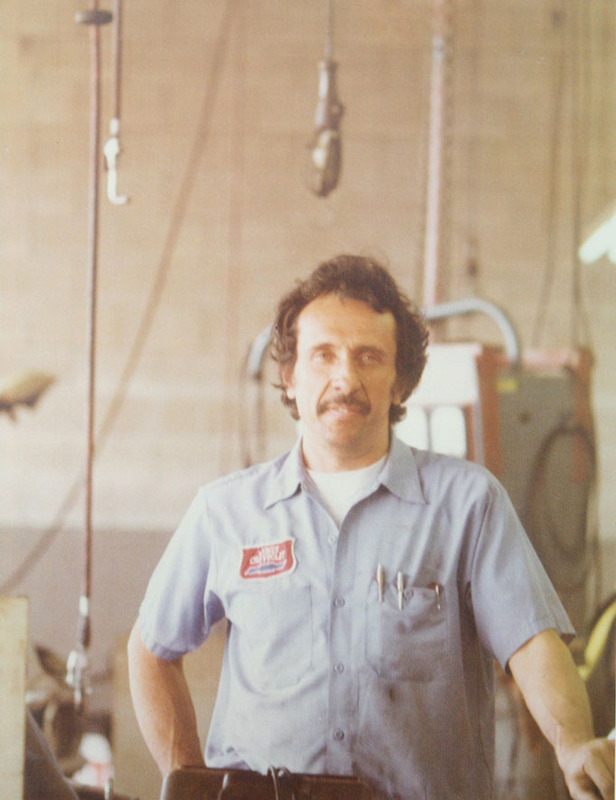 The first is my husband’s grandpa around age forty at work in the auto mechanic shop he owned. I love how the shot is framed, looking slightly up at him with all the equipment in the back. It gives a sense of what an average day would have looked like at that time in his life. The second is my awesome mother-in-law, pregnant with my husband. I just love the casual, funny, not posed nature of this photo. 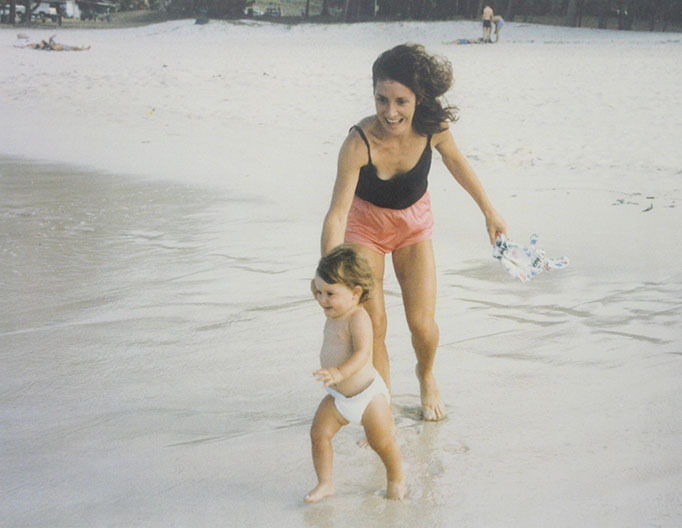 Lastly, is a shot of my mom chasing after a baby me on a beach in Hawaii. My mom just looks so young and happy and beautiful. I love the colors and sense of movement here too. These are just three of the more than 75 (!!) we ended up hanging on the wall. After choosing the photos, we had to resize, frame and compose them. Rather than hanging a million 4×6 photos, we had some blown up large, and some of the very old photos we kept very small, which adds a ton of interest. We kept the frames super simple because we didn’t want the wall to get too busy and we didn’t want to spend a million dollars. It’s amazing how quickly frames can add up! 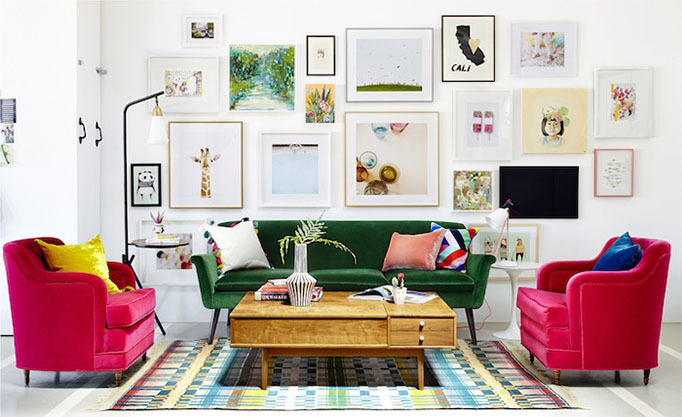 All the frames are from Ikea, Aaron Brothers and Target. We chose various white, black and birch frames for some variety, while still keeping things cohesive. We started by hanging the large photos first and tried for a pleasing amount of space between them. In other words, we didn’t want to cram all the big ones together and all the small ones together. With the big ones in place, we moved down to the next size and so on until we were filling in gaps with the tiny ones. 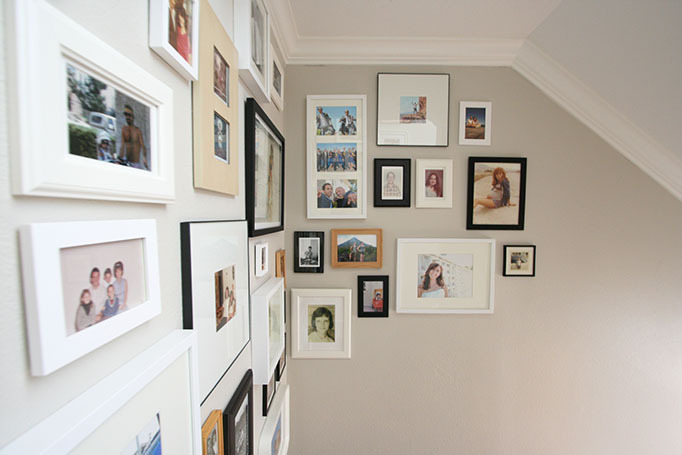 Another important feature is that we filled the whole wall, from floor to ceiling. Don’t be afraid to be bold with this! 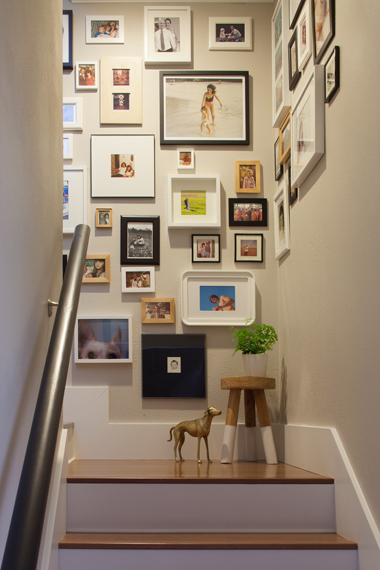 I even decided to wrap a few pictures onto the side walls for a more sculptural feel and to help visually lead you up and down the stairs. As busy as David and I are, and as long as we sometimes go without getting together with our loved ones, it’s nice to still be able to see them every day in this way. Plus, this is something that can totally evolve over time! Whenever we have kids of our own you better believe we’ll be adding and swapping for a long time to come. That’s all part of the fun! Hi, I’m Samantha Gluck. 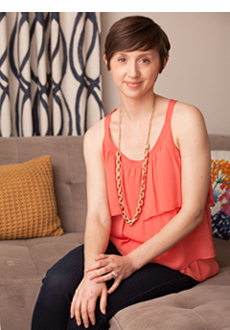 I am an interior designer and general enthusiast of all things creative, pretty, inspiring and offbeat. This is the world as I see it. Welcome!